By Maria Alive	Posted in	Blog, Movement Therapy	Click any image for an enlarged view. Are you looking for that last minute get away – not just a regular vacation, but instead a delicious yoga retreat to the magical tropics of Mexico? Please join me on this special journey January 7 thru January 13. Villa Ananda is our host, north of Puerto Vallarta, an intimate Villa based on the ancient wellness practices of Ayurveda and Yoga. With plenty of time to lounge on the private beach, there will also be daily yoga, meditation, sharing of ancient practices for health and healing, as well as offerings of Ayurvedic body work and a traditional sweat lodge. Your yoga practice becomes the center-point of your retreat. The TropicalYoga Retreat offers 2 yoga classes per day, in addition to daily meditation practices, and other offerings related to therapeutic yoga and Ayurvedica wellness. You will feel positive effects, as well as greater progress in your personal yoga goals. Stepping away from your daily life creates an openness to new ideas. Embarking on a Yoga Retreat creates an opportunity to see yourself in a new light. Meeting new people of like-minded qualities will promote new pathways to grow and learn. You will have time to de-stress, and create affirmations for the New Year. The beautiful, peaceful and safe setting of Villa Ananda allows you to slow down the chatter of the mind and more readily preside in the present moment. From that place of ease clarity may arise for your next steps in your life. Sometimes we have to be far from home to give ourselves the permission to truly relax. Being on a retreat allows you to listen to your body, rest when you need it, and be free from stress. There are planned activities, but all are optional. Yummy Meals prepared by an Ayurvedic chef. The Tropical Yoga Retreat at Villa Ananda is all inclusive*. You will enjoy three healthy and delicious meals a day without the need to prepare or clean up . Getting nourishment is easy and stress free. All the work is done for you. The intimate setting at Villa Ananda is conducive to taking personal quiet time, getting to know the others on retreat, as well as taking time to share experiences. 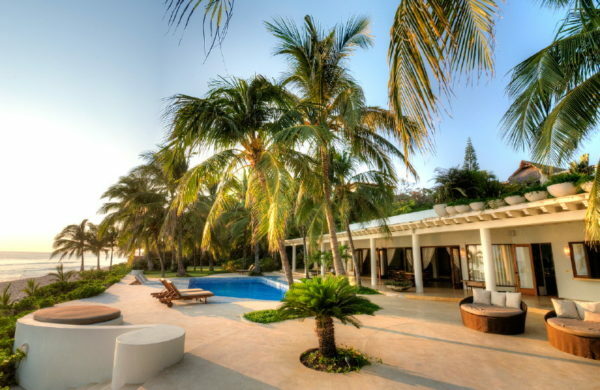 Maria’s Tropical Yoga Retreat is special in that all you need do is get your air flight to Puerto Vallarta. From there you are picked up by hired drivers from Villa Ananda, and brought directly to the Private retreat center. All meals are provided, there are wonderful sleeping spaces, and most activities are provided as part of the fee, including one Ayurvedic massage. Ready to join us? Click here to sign up!